Welcome to Movie Monday. On a Monday I pick a movie from the ones I've watched in the last week, and highlight what I think is the film's memorable moment. "Look through here...and I'll show you the future." Memorable Moment - I've seen this movie a few times. It's one of those films I like to call 'easy entertainment'; the ones you can watch mindlessly and still be entertained. That's not to say I hate this movie, because I actually quite like it. Sure it has some plot holes, but it's a good story with an intriguing idea. That's what I like most about it - the idea of what Earth might look like if it was destroyed. 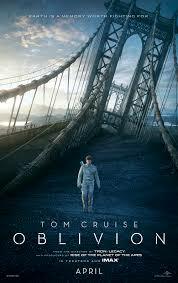 The film's memorable moment, for me, is when Jack and Julia visit the ruin of the Empire State Building. It's here we discover the truth of who Julia is, and Jack finally pieces together the memories that have been plaguing him. I enjoy this scene because I love NYC and the Empire State Building. Imagining this majestic landmark lying in ruins, amongst an equally ruined NYC, brings this story to life for me. It makes the film that much more realistic. Picturing an earth that no longer houses all our magnificient wonders (both natural and man-made) helps me get lost in the onscreen story. It might be science-fiction, but when Jack and Julia stand at the 'top of the world', I am able to envisage a real-life desolate Earth.